What's going on inside the old Cheyenne Diner? For a greasy spoon that enjoyed a quiet existence of churning out bison burgers to wanderers of the West Side, the story of the Cheyenne Diner has become fairly dramatic—even though the Hell's Kitchen landmark shuttered last April. 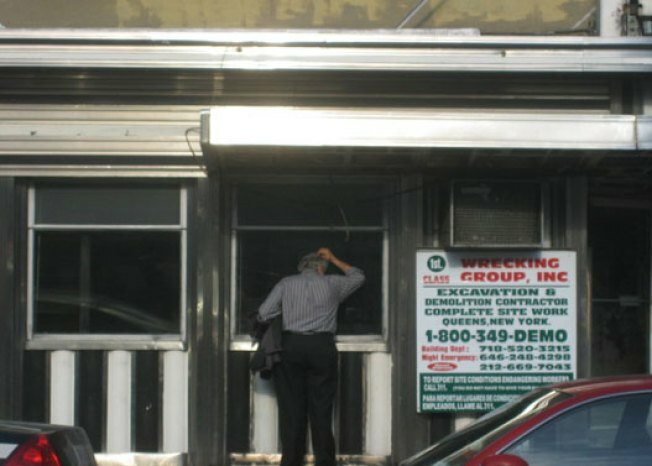 A lifesaving move to Red Hook fell through, and then a buyer from Alabamareportedly stepped in as the freestanding diner flirted with the wrecking ball. Now, as the Cheyenne prepares to retire down South, Vanishing New York stops by 33rd and Ninth to find locals bidding adieu to a Cheyenne stripped of any signs of its former self. That Wrecking Group Inc. sign has to give fans some pause. Is this the big-city version of telling the kids their sick family pet got "taken to a farm" to live out its days?